Glaucus atlanticus is a species of small, blue sea slug, from the family Glaucidae. They float upside down camouflaged: the blue side of their body faces upwards, blending in with the blue of the water, while the silver/grey side of the sea slugs faces downwards, blending in with the silvery surface of the sea. 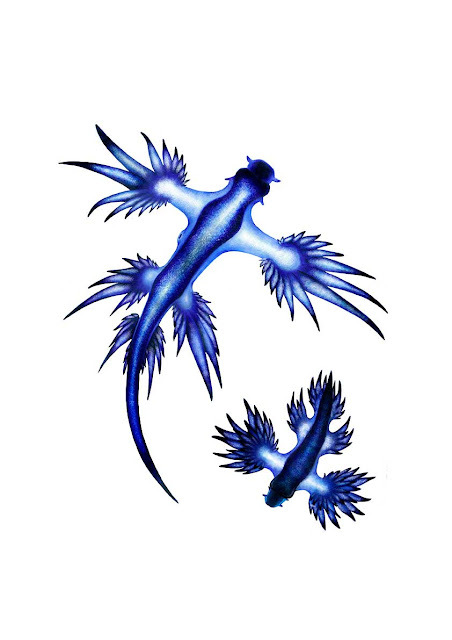 Glaucilla marginata is also a small blue sea slug from the family Glaucidae and is closely related to Glaucus atlanticus.